Cloud Climbing Beauty: Terrific Tuesday - The Anti-Aging Treasure from the Sea! Terrific Tuesday - The Anti-Aging Treasure from the Sea! 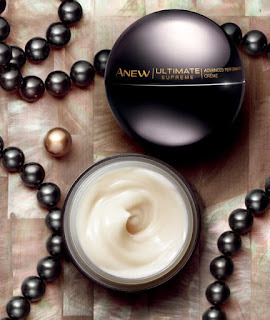 I wrote a blog post a few weeks ago about Anew Ultimate Supreme Advanced Performance Creme, and I want to share a few more details about it since it is now available in my eStore and in the C23 brochure. The ultimate in luxury, this skincare cream indulges your skin with a supreme experience and rewards it with immediate and long term results. It works on most visible signs of aging, even on the most advanced ones - including deep wrinkles, creases, expression lines, and skin firmness. Born in the exotic waters of Tahiti, the black pearl is known to improve skin's ability to retain moisture. Our new lightweight night cream is infused with black pearl extract and our highest level of Celluvive anti-aging complex, (also found in Anew Ultimate Day Cream and Night Cream), to help repair the look of all visible signs of aging * while immersing skin in radiant moisture for the ultimate transformative experience. Restores skin's ability to retain radiant moisture for the ultimate pampering experience. Infused with rare black pearl and gold mineral extract. Apply nightly on clean dry skin of face and neck. Can be used with any Anew regimen. 1.7 oz., Made in the USA!! C23 - Best Buys of the Brochure! VIBE - It's Here and It's Great! C22 - Best Buys of the Brochure! Terrific Tuesday - Rep Fest and Coupon Codes! Avon Skin Advisor - Recommendations in Seconds!